The Canadian Elite Basketball League announced Tuesday that international sports and lifestyle brand New Era Cap Co Inc. will be the Official On-Court Partner providing all on-court apparel and product for its six member clubs. The partnership is a five-year agreement running through the 2023 season. The professional basketball league opens its inaugural season in May 2019 in Edmonton, Hamilton, Guelph, Saskatchewan (Saskatoon), Niagara (St. Catharines), and Fraser Valley (Abbotsford). Merchandise is available now for all six teams at www.cebl.ca, and at the team websites: www.therattlers.ca; www.riverlions.ca; www.thebandits.ca; www.thenighthawks.ca; www.honeybadgers.ca; and www.thestingers.ca. 'The CEBL is honoured to partner with New Era, a company that has decades of history as a supplier to sports teams and leagues around the world,' said Mike Morreale, Chief Executive Officer of the CEBL. 'The CEBL is all about delivering world class basketball in a new way, and this partnership exemplifies that as we are the first basketball league for which New Era will be the provider of official game jerseys and other courtside apparel. 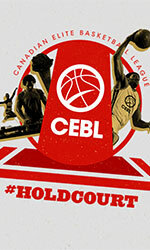 A national league created by Canadians for Canadians, CEBL rosters will be comprised predominately of Canadians playing professionally during the traditional basketball season, along with international players and players drafted out of U Sports programs. Each game day will feature a full slate of entertainment offerings before, during and after games. Teams will play 20 games, 10 at home and 10 on the road, during the 2019 season, starting in May and culminating in a four-team championship tournament to be held at a location to be announced this winter. New Era Cap Co., Inc. is an international lifestyle brand with an authentic sports heritage that dates back over 90 years. Best known for being the official on-field cap for Major League Baseball and the National Football League, New Era Cap is the brand of choice not only for its headwear collection, but also for its accessories and apparel lines for men, women and youth. The brand is worn as a symbol of self-expression by athletes, artists and some of the most interesting people around the globe. New Era Cap encourages people to truly express their personal style and individuality through its products. The Company is headquartered in Buffalo, NY and operates facilities in Canada, Europe, Mexico, Brazil, Australia, South Korea, Japan, China and Hong Kong.